1 What is Type 2 Diabetes? Type 2 diabetes is generally a result of poor diet, exercise, or other health factors. Although, it can also occur in teens, it is not a symptom that a person is born with. Children that are overweight can have symptoms of pre-diabetes, which means their diet should be controlled, exercise should be introduced or increased, and their sugar should be monitored for any signs of problem. Warning signs can be very low key, and are sometimes only noticed during routine exams (blood, urine) at your doctor’s office. For some, it’s strictly random; a friend might ask to have their blood sugar tested using the glucose meter of a known diabetic. To their surprise, the reading may show an elevated blood sugar. A one-time elevation is not necessarily something to worry about, especially if candy, fruit, or other food has recently been consumed. If a high glucose reading occurred on a random test, tests should be done for a few weeks, at different times of day, preferably when no candy or high sugar items have been consumed. However, for a person who has never exhibited symptoms, the spontaneous onset of either frequent urination (as every 20 minutes) accompanied by intense thirst, is a reason to arrange to be seen by a doctor to test for Type 2 diabetes. Treatment for Type 2 diabetes is complicated and different for each individual. Many doctors prescribe a series of pills, in increasing dosages, in an attempt to control blood glucose levels. In addition, a patient is instructed to increase exercise, and change nutritional and dietary habits. Most healthcare facilities have diabetic educators and nutritionists who offer different degrees of assistance, some of which may be useful to some, and not for others. In addition to pills, your doctor may prescribe others—to maintain blood pressure, cholesterol, and other factors that have instantly increased your susceptibility of having a heart attack. Even cholesterol levels that are average for the normal community may need to be lower for a patient with Type 2 diabetes. A doctor will schedule a diabetic patient for blood glucose readings every six weeks. When reading the results, the lab can determine an average blood glucose reading for the previous three months, and deliver a score of 1-12. If pills do not lower blood sugars adequately, insulin therapy may be introduced. This is a much more serious level of monitoring and regulating blood sugar, as it requires keeping enough food in your body to ensure stability of insulin intake and production. Whether trying to avoid diabetes, if you already have pre-diabetes or if you have diabetes and want to control it fitness as well as diet is important. Type 2 diabetes is related primarily to weight so lack of exercise may have been what caused problems in the first place, so now you need to lose weight, perhaps you have exercised for a long time, maybe not at all. You now have to get yourself motivated though. Start small and build up, make exercise part of your life though, as you become fitter you can do more strenuous exercise even if its within the same times you’ve set yourself to begin with. Being in the habit makes it easier, once you get going and adrenaline starts going you may well surprise yourself and push yourself as well, though don’t overdo it. Set yourself goals, if it helps also offer yourself rewards if you meet your goals. Get family and friends involved, doing exercise with other people can be more enjoyable and they will be good support, also once you set a time and date and a friend turns up to go out walking or jogging then it is a lot more difficult to say no or make excuses. Walking is exercise but you may need to do a fair amount to get the benefit, the great thing is you can do as much as you are comfortable with, when you stop you should recover fairly quickly unless you are very unfit you should only be able to do yourself good. With so many people suffering from both type 1 and type 2 diabetes there is plenty invested into finding cures and treatments by many major drug companies. Unfortunately as yet no cure has been found for either type. In type 2 it would be likely that a cure would halt or reverse the process where cells receptors don’t react as they should to glucose meaning extra glucose in the blood. Type 2 Diabetes though has on rare occasions gone into remission showing that it is likely that it is possible to cure diabetes type 2 and it is better understood all of the time. Though in some cases this has been linked to fitness and diet it has also come about through gastric bypass surgery that doesn’t always work yet by any means. One cure may be transplanting beta cells or even stem cells this has so far failed due to the immune system attacking these cells. Recent drugs to be developed are Pramlintide and Exenatide. Pramlintide is a synthetic version of the Amylin hormone which works in a similar way to Insulin without causing hypoglycaemia (low blood glucose level). Exenatide can increase insulin secretion and lowers blood glucose level, it only does this though when blood glucose is at a high level however. Diabetes often seen as a non-serious disease is in fact a real killer; many people find out too late when they already have it just what effects it can have on them. Diabetes kills more people than AIDS and Breast Cancer combined and the other complications some of which lead to death can be unpleasant as well. When you are first diagnosed you can manage your diabetes well but it is progressive and eventually you will need medication and may have complications. One of the most common and most feared non-lethal complications is blindness caused by excess glucose in the blood but hearing can also be affected. Skin problems including itching are often among the first symptoms of diabetes and many people only realise they have it when this starts, skin infections and other disorders are more likely with diabetes. Neuropathy is the numbness they may occur in a sufferers feet, this comes from nerve damage and can lead to further complications if the foot is damaged or infected and the person may not be aware. Heart and Kidney disease are the main killing complications of diabetes; they can be managed by also managing blood pressure and intake of cholesterol. Diabetes is a condition cause where your pancreas cannot create enough Insulin for your body’s needs. In type 1 diabetes the pancreas fails producing less insulin or no insulin. In type 2 diabetes the pancreas has been required to produce extra insulin, this may be because there are excess cells or because cells no longer use insulin as they should meaning more is needed for the same effect to make them take on glucose, the pancreas eventually is unable to keep up with the need for insulin of the body. Excess glucose in the body that hasn’t been taken on by your cells leads to complications. Complications caused by diabetes include blindness and heart disease, many diabetes sufferers will eventually die from heart disease or heart attack though this can be stopped for a long time. Diabetes also leads to skin complaints including itching which may be what alerts some people to their condition, it can lead to hearing loss and kidney disease as well though. The idea that diabetes is not a serious disease is wide-spread but sadly wrong. Management of diabetes includes making sure that you deal with high glucose levels through exercise and also deal with low glucose levels by eating the right kinds of food to give you a boost, having a meal plan and eating at the right times can make a big difference. Blood pressure can also be managed to minimise the chance of developing either heart or kidney disease. Insulin has important jobs inside the body. One of them is to help carry sugar (the broken-down foods you eat) into muscle and liver cells to be used for energy. Another is to push fat into fat cells to be stored for later use. The pancreas is the organ where insulin is produced. Beta Cells reside in the pancreas and are responsible for creating the insulin. If your doctor says you do not produce enough insulin, this is likely due to Beta Cell damage or destruction. Beta Cells are damaged and destroyed in many ways including; excess weight, diets rich in fats, sugars and starches, stress, steroid use, prescription medications and lack of exercise. If they are destroyed, the body does not replace them. Beta Cells simply get more exhausted and produce less and less insulin, usually to the point where insulin injections are needed to stay alive. Insulin resistance is when the body’s cells don’t accept the insulin that is made by the body. This means that when a person eats, insulin is injected into the bloodstream by the pancreas to carry the sugar and fats away into the proper cells. The cells resist the insulin and the sugar and fats remain in the bloodstream, resulting in high blood sugar and high blood fats. Hence, this is why most type 2 diabetics are overweight or obese. Type 2 diabetes, like heart disease and stroke, is a silent killer. It doesn’t come on overnight; it isn’t painful (at first). In fact, most people who are diagnosed with type 2 diabetes are done so while being treated for something else. Millions of people have this disease right now and are not even aware they have it. For many thousands this year, it will be too late to reverse the damage already done by this quiet but deadly disease. At first, some of the signs include; constant thirst, weight loss or weight gain, tingling in the hands and feet, increased hunger, blurry vision, etc. Untreated, type 2 diabetes moves on to more severe complications such as increased urination, retinal damage, wounds that don’t heal, gangrene, amputations, blindness, heart disease, stroke, kidney failure, dialysis and death…to name a few. It is vital that everyone with type 2 diabetes learn all they can about this disease and what they can do to reverse the causes instead of medicating the symptoms. Type 2 diabetes can be reversed…the damage already done by this disease cannot. So, what is a healthy blood sugar level? This number varies greatly from doctor to doctor. In the past, a person was not considered to be diabetic unless their fasting blood sugar was over 150. Today those numbers have changed from 80-130, depending on the doctor. Why? We can only explain this constant changing as a way for the healthcare industry to be able to diagnose more people with type 2 diabetes and prescribe money-making drugs to control the symptoms. Recent studies done with more than 100 diabetic heart disease patients proved that 100% of them had diets that included fast food at least 2-3 times a week. We are a society of fast everything… fast cars, fast lifestyles, credit cards that allow us instant gratification, microwaves for faster cooking, fast food for faster suppers… Changing our way of life can be difficult, but it can be done. It is our way of life that is killing hundreds of thousands every year. Our environment, our stressors and our diets all play out in the big game of life. Strive to make small and meaningful changes every week. Walk for 15 minutes a day, add more raw vegetables to your diet, drink more pure water and less soda, etc. By making small changes every week, you’ll become accustomed to them slowly and won’t feel like you are doing an abrupt 360. Learn all you can. Read books, get online and talk to others with type 2 diabetes. Find what works best for you and if you find something that works…by all means share it with others. You never know whose life you’ll save. It is easy for many of the people diagnosed with Type 2 Diabetes, to ignore symptoms and warning signs at least in the initial stages, but as the condition matures type 2 diabetes complications become harder and more strenuous on the body. It is no secret that diabetes targets and affects heart the most, so most serious complications associated with type 2 diabetes are chronic like, chest pains and shrinking arteries. Other type 2 diabetes complications are equally serious in nature and magnitude. A very common one is nerve damage due to access sugar in blood cells, kidney damage which can lead to complete or partial failure of kidneys and eye damage. All these complications are caused mainly by rising blood sugars in blood. 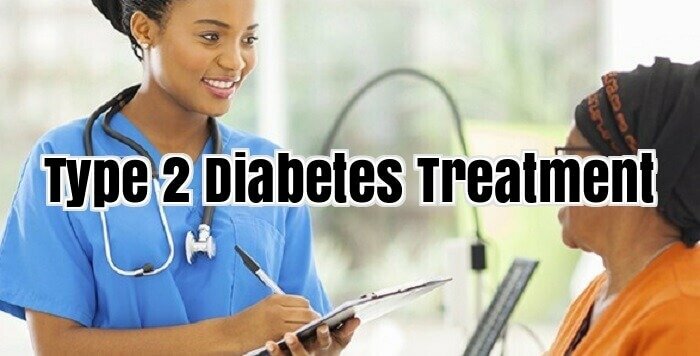 Type 2 diabetes seriously hampers blood flow to various body parts like foot and toes, initially small blisters and swelling can be evident but if proper care is not taken then the eventual solution can be amputation and nothing else. Type 2 Diabetes complications include higher risks to skin infections and diseases, even infections in gums, fungal and bacterial infections are more profound in diabetic patients. Other complications caused by type 2 diabetes are hearing malfunctions, weakening of bones and increased chances of Alzheimer’s disease. It is suspected that poor blood flow, caused by higher sugar levels, contributes in increased number of brain strokes thus increasing the chances of acquiring Alzheimer. However, type 2 diabetes complications can easily be avoided if proper changes in living style are maintained. None of the above mentioned complications are too sudden or happen overnight. If proper care is taken then these complications can not only be avoided but they can be mitigated once discovered. For instance daily exercise and well balanced diet can reduce all complications related to blood sugar levels. Proper and regular inspection of toes, foot and hands can decrease risk of swelling and blister formation in foot, proper corrective measures can be taken once such complications are found. And lastly, maintaining healthy skin is as easy as using anti bacterial soaps and taking baths regularly. None need a special effort but all need some effort and rewards of that effort are in the form of prolonged and healthy life. Type 2 polygenic disorders are related to AN exaggerated risk for bone fracture, and girls’ square measure in danger of pathology or weak bones when climacteric. Scientists at the monetary unit Mediterranean bioscience Institute in urban centre, Italian Republic and different analysis centres throughout Italian Republic checked out biological time girls with sort two polygenic disorder to be told the danger of bone fractures in girls with each conditions. Their study, reportable on within the Journal of Biological restrictive equilibrium Agents in January 2015, compared…eighteen biological time girls with sort two polygenic disorders with eighteen healthy girls for three years. All participants were between the ages of fifty five and seventy. Bones altogether the participant’s hands were examined with ultrasound. At the start of the study, there was no distinction seen between the 2 teams. When 3 years it absolutely was found the bones within the diabetic participants were porous on the within – this wasn’t seen within the healthy women’s bones. The surface of the diabetic participant’s bones was denser than the bone surfaces of the healthy girls. As bone becomes a lot of porous it becomes weaker, whereas denser bones square measure stronger. Within the bones of diabetic girls the inner body become weaker whereas the outer half became stronger. This might recommend that girls with sort two polygenic disorders got to work on strengthening the inner bodies of their bones. Metal is removed or supplementary as required and per organic process standing. Eating many fruits and vegetables helps give vitamins and minerals required for protective durable bones… Consumption dark inexperienced vegetables like broccoli, bok choy, kail, and greens can give the metal that’s used for building bones. Soy product with metal supplementary square measure otherwise to induce metal, or a metal supplement may be enclosed within the diet. Get enough vitamin D by defrayment some minutes on a daily basis move into the sun or by consumption fortified foods. Limiting salt, caffeine, and alcohol is additionally useful. Weight-bearing exercise, like walking or lifting weights, creates the necessity for stronger bones. Once the body senses that require it’ll begin adding a lot of metal to them… Walking may be a straightforward style of weight-bearing also as aerobics and walking whereas carrying weights over your head is a way of keeping your vertebrae sturdy and lowering their risk of collapsing. General exercise, golf, and sports implement sports like court game; squash and field game stress the bones in order that they’re going to soak up a lot of metal. Tai chi chuan and yoga are shown to weight your bone loss in older girls. Although, managing your illness may be terribly difficult, sort two polygenic disorder isn’t a condition you want to simply stick out. You’ll build straightforward changes to your daily routine and lower each your weight and your blood glucose levels. Continue there, the longer you are doing it, the better it gets. Type 2 diabetes is an illness that has been on the rise over the last century. Diabetes is diagnosed when there is a defect in the production of insulin by the pancreas. Glucose or blood sugar is the principal energy source for the body. Without insulin, the body cannot utilize this energy source. When this happens, the sugar that circulates in the blood is too high while at the same time, the sugar that is absorbed in the body tissues is too low. Diabetes mellitus, the medical term, is usually divided in two classifications: type one and type two. In type 1 diabetes, the blood sugar must be controlled with a combination of insulin and diet. In many cases type 2 diabetes can be controlled by diet alone. Diabetes has often been called a food disease because it associated with the diet. Diabetes, whether it be type one or type 2 is controlled, to a certain extent, by what the person eats. This disease is a disorder of how carbohydrates are metabolized. In this disease sweet or starchy foods are metabolized differently in diabetics. Type 1 diabetics control their disease with insulin and diet. Type two diabetics usually control their disease with diet and exercise. . This is especially true for the diabetic. Exercise speeds up the metabolism and increases heart and lung health while sending oxygen through the body. Until recently, type two of the disease was called adult onset diabetes because it was most often seen in overweight young adults. Now with the surge in overweight children and a parallel number of children with the disease, it has become apparent that there is a correlation of diet and disease. In type 2 diabetes, the pancreas does produce some insulin, but the insulin produced is ineffective. Because of this, the body can restore its original function by careful attention to diet and exercise. In type 2 individuals, some insulin is produced. Many patients are given oral medication to help the pancreas produce enough of the insulin needed for the body to function properly. This medication may not be insulin but serves as a booster to help the pancreas continue to produce the insulin the body needs. Making wise food choices will help the body keep its sugar level stable. Today’s processed food is heavy on starch and sugar additives and low on fibre. This prevents the body from performing properly and using the food the way it is supposed to be used. A good rule of thumb is stay away from foods that come in a wrapper. Choose good lean protein sources and fruits and vegetables that have not been mechanically processed. In addition to these suggestions, the benefit of daily exercise cannot be over stated. Exercise is the one thing that does not cost any money and is of great support to general good health. Keep track of sugar levels by testing blood at least three times a day. Contact a physician if anything seems out of the ordinary. Seek out a professional dietician for the exact amount and type of foods for carbohydrate metabolism. Sweet or starchy foods are metabolized differently in diabetics. Type 1 diabetics control their disease with insulin and diet. Type two diabetics control their disease with diet and exercise. Your specific needs and always know your A1C level. Follow these simple rules for controlling type 2 diabetes and you should have well maintained sugar levels. A healthy diet recommended for a type 2 diabetic is ultimately just the same as the nutritious diet encouraged for anyone. You don’t need to strictly follow a programme that only uses specially made diabetic foods but it is worthwhile to take notice of any diabetic nutritional advice you might find. Although, you can simply follow a healthy eating plan, you may find it more helpful if your doctor develops a diabetes weight loss plan especially crafted to tackle your individual needs and help you maintain balanced blood glucose rates. If you are thinking of starting a diet regime, you should remember that your key goal will be to ensure your blood glucose levels stay within the healthy limit advised. Another objective should be to preserve safe levels of blood fats (lipids) to minimize the chance of vascular illness – a recognized problem for type 2 diabetics. Diet specifications are variable and can be influenced by the individual’s well being, finances, lifestyle, and location. They can also be affected by the motivation the person has to educate themselves and work out the changes they need to make in their life. A healthy diet regime recommended by health specialists for individuals who have type 2 diabetes include carbohydrates which are high in fibre, reduced fat dairy foods, water, oily fish, an abundance of fresh fruit and vegetables, and a low intake of saturated fats. The benefits of such natural, fresh ingredients see a person’s nutrient consumption increase. This, as a result, enhances the diabetic sufferer’s overall healthiness which has been adversely affected by the lack of trace elements found in their body. Following this guidance will easily transform your eating routine to a healthier and stronger profile. It will also avoid the danger of unintentionally overdosing on a specific source of nourishment and will prevent potentially harmful conflicts being established between medication and dietary supplements. You can find numerous type 2 diabetes meal plan suggestions on websites, newsletters and magazines related to the disease. You can also choose between regular healthy weight loss plans and specific diabetes diet regimes to follow. You may have heard many experts saying that type 2 diabetics must adhere to a minimal carbohydrate diet – but that is simply not true. Instead, diabetics just need to ensure that they eat frequently, that they carry appropriate snacks with them at all times, and that they regularly test their blood glucose prior to and after meals. A good piece of advice to increase your understanding of your condition is to keep a diabetes log book. This means that you should record your blood sugar levels before a meal and after it, and you should also write down any extra information regarding what you eat. This will ultimately help you decide which foodstuffs are best for you and which ones cause adverse reactions. For example, you will soon recognise the food choices that throw your blood sugar levels off the scale and learn to avoid them. By testing regularly and listening to your body you will understand the best and most nutritious foods to consume regularly. Unless specifically recommended by your doctor, you shouldn’t restrict yourself completely from eating any food type. Instead you should just learn to take things in healthy proportions ensuring you treat yourself occasionally. Good ideas and interesting tips can be found in cookbooks; invite your friends round to enjoy innovative, experimental meals you’ve discovered and the whole party will see that diabetic catering isn’t difficult to do. Just make sure that you balance out your eating with a healthy level of exercise – it’s not a good idea for anyone to be overweight and obese (diabetic or not!) Try to remain positive about being diagnosed with type 2 diabetes and remember you’re not alone – there are an increasing number of people discovering they have the disease daily. Diabetes related depression can sometimes occur but if you eat healthily and reward yourself with a little treat occasionally, you will see that diabetes isn’t the worst thing in the world. On the plus side, if you follow a diabetes diet programme, you’ll find yourself bouncing with new found energy and well being. A diabetes 2 diet plan can be the same as any other good nutritional guide that non-diabetics follow too. Remember, that it’s nothing more than that and don’t feel the need to overcomplicate your regime. This will make it much easier to stick to in the long term. There is a deluge of natural supplements in the market and alternative healing methods all claiming to provide a cure for Type II Diabetes but can they really deliver as their aggressive advertisements would suggest? Finding a real natural as well as medicinal cure for Type II Diabetes could be farfetched at the moment but medicinal research and development are gearing towards a more natural approach for preventive maintenance and diabetes management. Natural Herbal supplements targeted for diabetics are in the rage nowadays but they can only do so much as far as supplementary nutritional booster for diabetics is concerned. Chromium is an essential trace element found in the many natural foods we eat like fruits, vegetables and in whole grains. Chromium is essential for the maximum effectiveness of insulin in the body and the speedy process of utilizing glucose in the body for energy. There are also chromium dietary supplements available in the market and should be taken at dosages recommended by your medical professional and nutritionist. The type of ginseng associated most with diabetes is the American Ginseng. Studies conducted on this North American ginseng variety (Panax quinquefolius) have shown that it can improve the control glucose levels in the blood. This is promising indeed but should require further tests and research. Bitter Melon is being used all over the world for thousands of years as a potent remedy for various ailments but it is mostly associated with the treatment of diabetes. Studies have shown that bitter melon has a lowering effect on high glucose levels on the body of test patients. Cinnamon is another promising product that can help regulate glucose levels in the body. Several studies have conducted to find out whether cinnamon can indeed lower blood sugar levels among the Type II Diabetic test subjects. So far the results have been very encouraging. There is also the alternative medicinal and therapeutic approach for the treatment of diabetes which provides holistic, non-standard and sometimes controversial healing procedures. These alternative healing approaches include acupuncture which is a traditional Chinese procedure where a practitioner inserts needle at specific parts of the body to trigger and redirects body energy and release the natural painkillers of the body. This is particularly beneficial for patients suffering from neuropathy and other nerve complications arising from diabetes. In totality, Proper management of diabetes through proper diet, a healthy lifestyle, and taking in prescribed medications is still the way to combat the disease. As research scientists in the field of medicine are still trying mightily to seek a real and lasting cure for the diabetes in the form of a drug or a medical procedure, people with Type II Diabetes still can lead normal and healthy lives as long as they can delay the onset of serious complications associated with diabetes for as long as possible. This is the primary goal of diabetes management and indeed, many Type II diabetics’ reaches a ripe old age of 50 to 60 years without even a trace of diabetes complications.